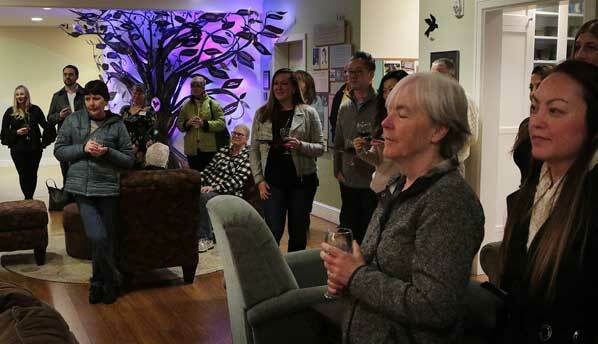 Supporters of The Dougy Center for Grieving Children & Families gather in their headquarters’ “living room” to await the presentation of the substantial donation. The Dougy Center for Grieving Children & Families, long based in the Creston-Kenilworth neighborhood on SE 52nd Avenue, just south of Foster Road, has survived a devastating fire and other setbacks over the years. And, the organization continues to thrive, thanks to the support of their volunteers, and financial sustenance from bequests, donations, and grants. The innovative Center now shares their model of care through training locally, nationally, and internationally, assisting individuals and organizations seeking to help children in grief. On January 29, The Dougy Center learned they’d be getting big boost from the New York Life Foundation – a $1 million grant to be received over the next three years. 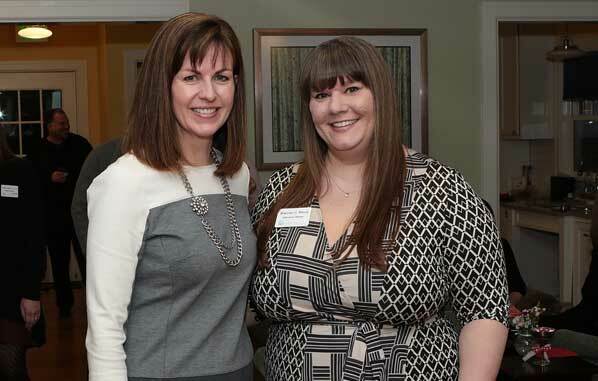 The Dougy Center’s Board Chair, Ashleigh Gunter, spends a moment with Executive Director Brennan Wood, before stepping up to formally accept the $1 million grant. “This grant will fund program development trainings, scholarships, and a best-practices manual that will help share our Center’s model that emphasizes peer grief support – in which children and teens share their experiences through play, art, talking, and other activities,” explained Dougy Center Board Chair Ashleigh Gunter – while accepting the “big check” on Friday evening, February 8. 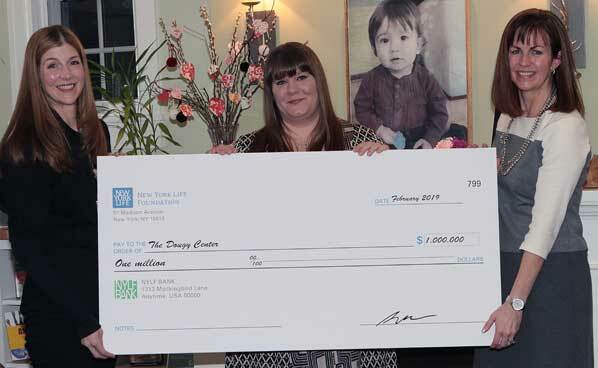 Local New York Life representative Kimberly Wuepper Rudick presents the ceremonial check to Dougy Center Executive Director Brennan Wood, and Board Chair Ashleigh Gunter. To learn more about The Dougy Center, see their website: CLICK HERE to open it.